Monster High dolls are ever popular with their grown up looks and quirky features. Draculaura is perfect for this time of year with Halloween on it’s way and she has a special lever on the front of her dress that allows her to transform her skirt into bat wings. She has a pretty pink dress that she wears when being a normal ghoul with a full, fancy skirt covered in hearts and bat wings. Her hair is black with pink highlights and comes in a high ponytail. I like the pink heart detail on her cheek. She also has pink high heeled shoes which are removable although stay on quite firmly during play. The centerpiece of her bodice is in fact a plastic lever that can be simply pulled down to reveal a more vampy looking dress as well as lifting her outer skirt to create bat wings. This feature works really well and is easy to do. The wings feel sturdy once in place and gives her a new feature, being able to fly which allows children to further their imaginative play and hold her up, pretending she is flying through the sky. I think this doll is well made, she has limbs that can be bent and moved during play aswell as her transforming feature. The clothes also look good and the whole doll appears durable and of a good quality. Both my children have enjoyed playing with Draculaura from Monster High and have had fun integrating her alongside other dolls and toys we already have. They have created a lot of fun play scenes and particularly love using her to fly through the air to move around so her dress has had a lot of conversions to bat wings which has kept them entertained! This is just one of many of the fabulous Monster High dolls and they are well worth checking out if your children are fans, as they are well made, durable and have lots of fun, quirky features and endless play value. 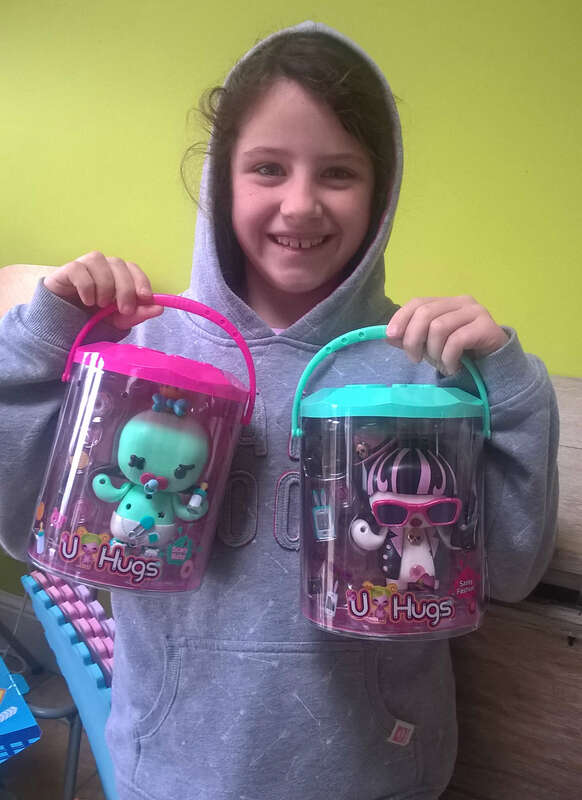 U Hugs are customisable dolls each with their own character and accessories, although these can easily be mixed and matched between dolls to create your own character. From Flair, a second series of these dolls has been released with some fun themes and designs. We’ve been checking out a couple of them below – take a look! The first one we looked at is Cheeky Kitten who was both mine and my daughters favourite. She is really cute and has some fun features such as a pin on tail to put on the back. The unique part of these dolls are the pins, which are basically the accessories, which all have a simple push in pin like action to push into any of the 16 holes that can be found across the doll. The dolls all have a soft rubbery body, there are no sharp bits and these are so easy to change around almost instantly. Being a cat, she has cute accessories like a fish, bird and mouse as well as a cute collar with a bell. Time-Off Elf is also really cute and perfect for this time of year. As you can see each doll comes with a selection of small accessories, but also their hair, jackets and skirts are all removable and can be swapped around. There is a diamond style pin for the top of the head which has a hole through it so the dolls can be used for hanging up or carrying with the loop included. My daughter enjoys these and has a collection on her bedroom shelf already, she often shows me her new creations where she has mixed and matched them with each other. 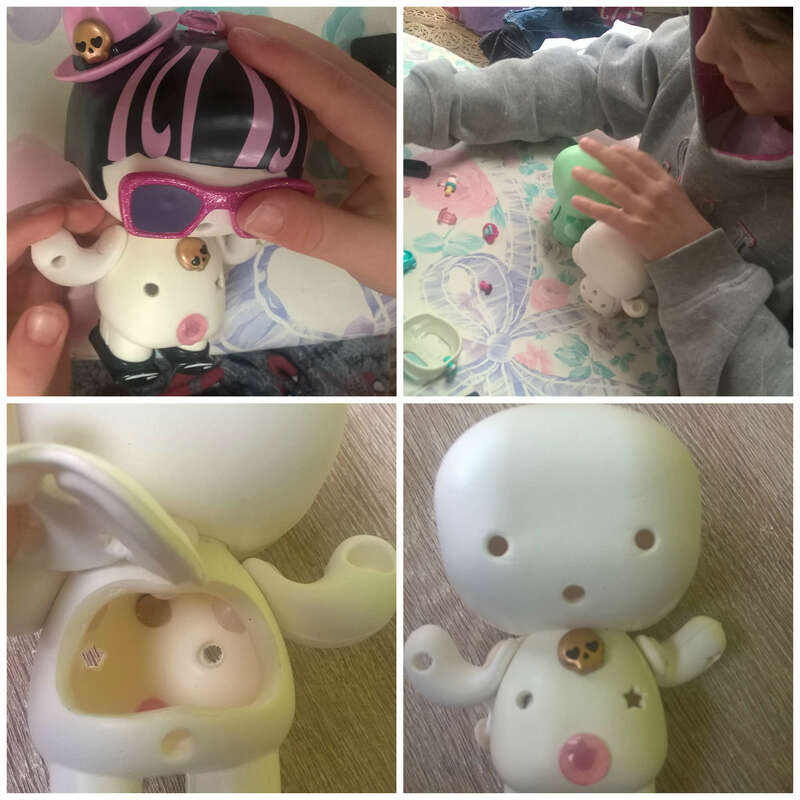 A huge plus with these dolls is that they are hollow and there is a removable patch on the back of them, that is easily opened and closed with a pin. This means that inside you can store all the little accessories that the doll isn’t currently wearing – a brilliant idea which helps to keep things all together so less chance of them getting lost. Here is one of the creations my daughter made substituting the eyes for some other fun elements! These are fun toys that both my children have enjoyed playing with. Even my younger boy has fun customising them in various ways and showing me how he got on. For something different, then these are a bit of fun, and if your child likes playing with accessories on dolls then these could be the toy for them. 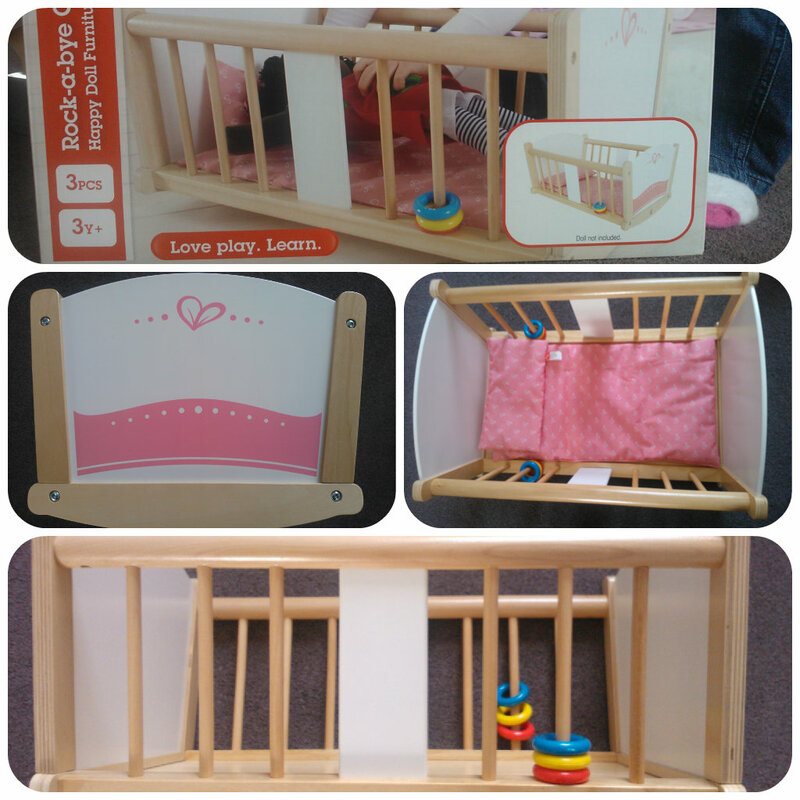 A fun, durable doll with fun features, available from all major toys shops now. U Hugs are a new range of customisable dolls from Flair, that come with interchangeable accessories to create a multitude of looks. The dolls comes with holes across the body to insert the accessory pins onto. Each doll comes with 12 pins although you can mix and match these across any of the dolls. We receivd Sassy Fashion and Scary Baby to try out. Aimed at children 5+, my daughter was quite excited at the sight of these and couldn’t wait to get them out of their boxes. The dolls are made from a soft rubber, so are easy to play with and place the accessories into the holes. What is really clever and thought out about with these dolls is that they have a panel on the back of their bodies which unpins to reveal a cavity inside the doll, in which you can store most of the small accessories. This is a brilliant idea as with most toys and small parts, they can easily get lost amongst other toys and it’s hard to find the bits you want. The U Hugs dolls have interchangeable eyes, mouths, accessories for their hands and holes in the front of their bodies. The shoes can even be turned around for a different look. The jacket on Sassy Fashion can be removed as can Scary Baby’s nappy. Here are some different looks Miss M created by switching the pins around. She seems to enjoy the dolls and playing with the pins and is often found carrying one of these dolls around with her. 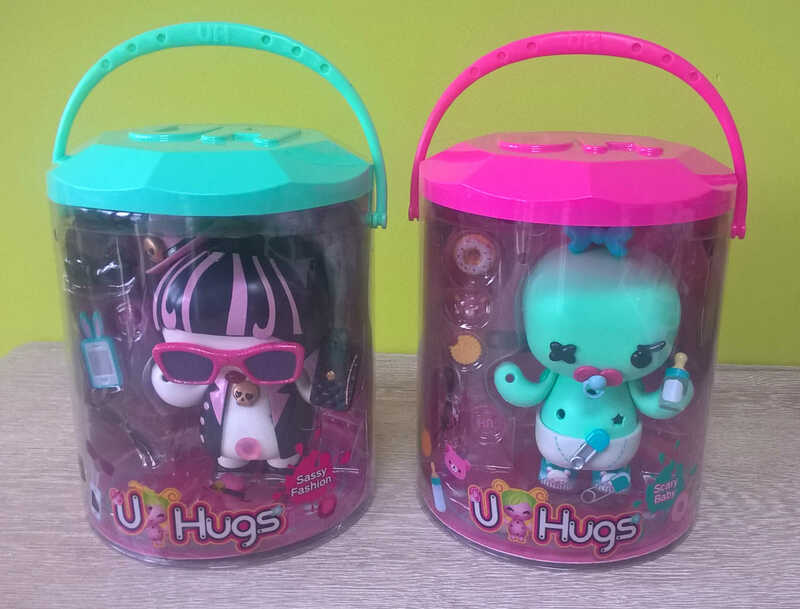 The U Hugs are a new breed of dolls and so far there are six different models to collect. They are fun, can be changed around to reflect your mood, style, feel for the day giving them a new look each morning. We’ve enjoyed these dolls, why not check out the range now? Barbie Rainbow Hair is the latest Barbie to be released from Mattel. 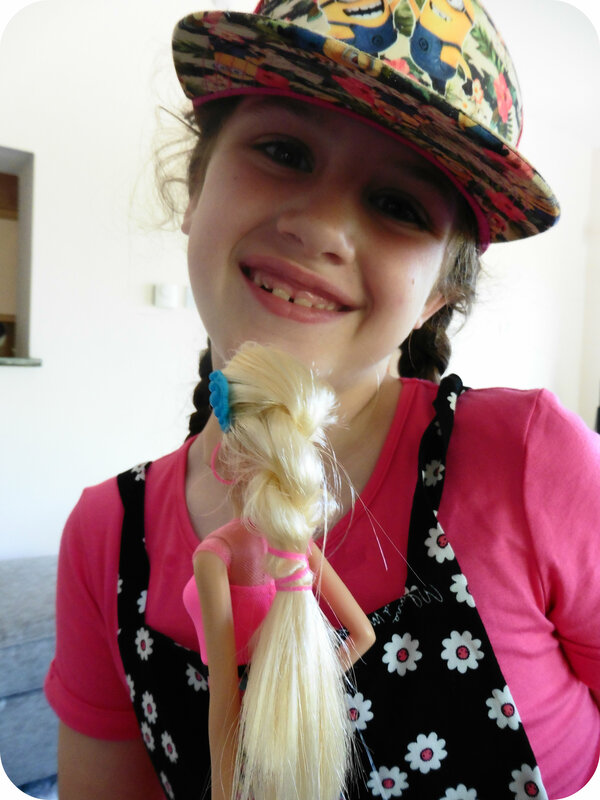 This fashion forward Barbie looks stylish in her outfit and has long flowing blonde hair, waiting to be styled. Rainbow Hair Barbie comes in a dress and glamourous pair of black heels. There are a also a selection of hair accessories, a blue brush, 3 hair clips, 2 hair bands and a colouring tool. The colouring tool is like a mini set of hair straighteners which you insert the coloured palette into. You then press the tool around some hair and pull down the hair to impregnate some of the colour onto the hair. 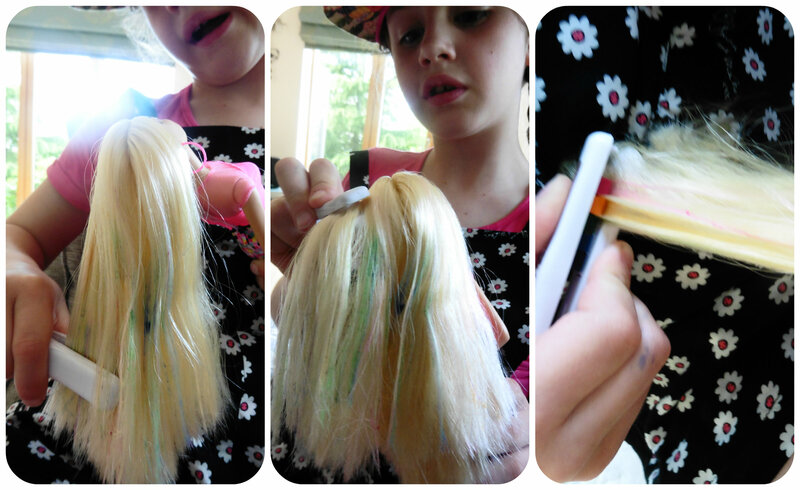 Miss M really enjoyed decorating Barbie’s hair, although to be honest I didn’t think the colouring tool was that great. You had to press quite hard and the colour is quite patchy. Despite my thoughts, Miss M was happy and also enjoyed the process of giving Barbie a hairwash after to remove the colour and start again. 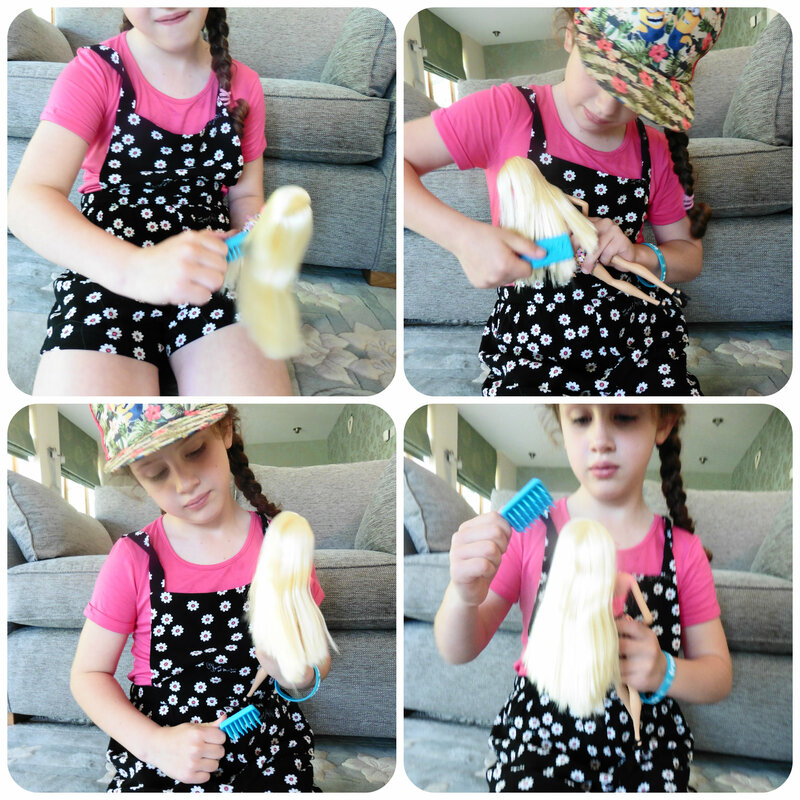 (We turned our bathroom sink into a little salon while Miss M happily sat lathering up Barbie’s head with shampoo). What really appealed to Miss M about this Barbie, above others, is her long straight hair. It’s really smooth and shiny and with it being so long it was easy to plait and style, something Miss M thoroughly enjoyed doing. She has spent all weekend, brushing and caring for Barbie’s hair giving her lots of funky new styles. 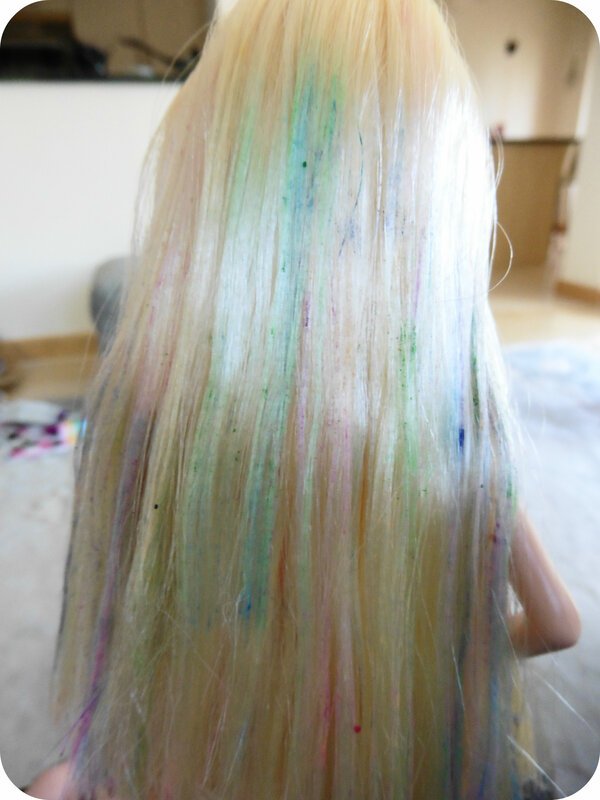 Miss M is 7 and has enjoyed the Barbie Rainbow Hair, and although I don’t overly rate the colouring aspect of this Barbie, I do love her long flowing hair which has provided lots of hair styling fun! All reviews are my own and my family’s opinions and the toy was sent to us in order to write the review. 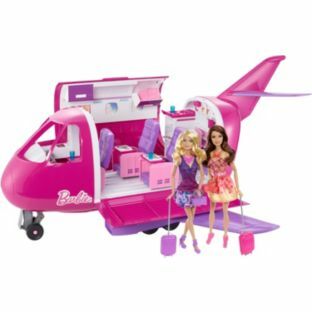 Argos have a large range of Barbie toys and accessories available and one that caught our eye is the Barbie Jet and 2 Dolls Playset. Miss M is really enjoying playing with Barbie at the moment and has small accessories but longs for some sort of vehicle to move them around in so this seemed like the perfect toy. 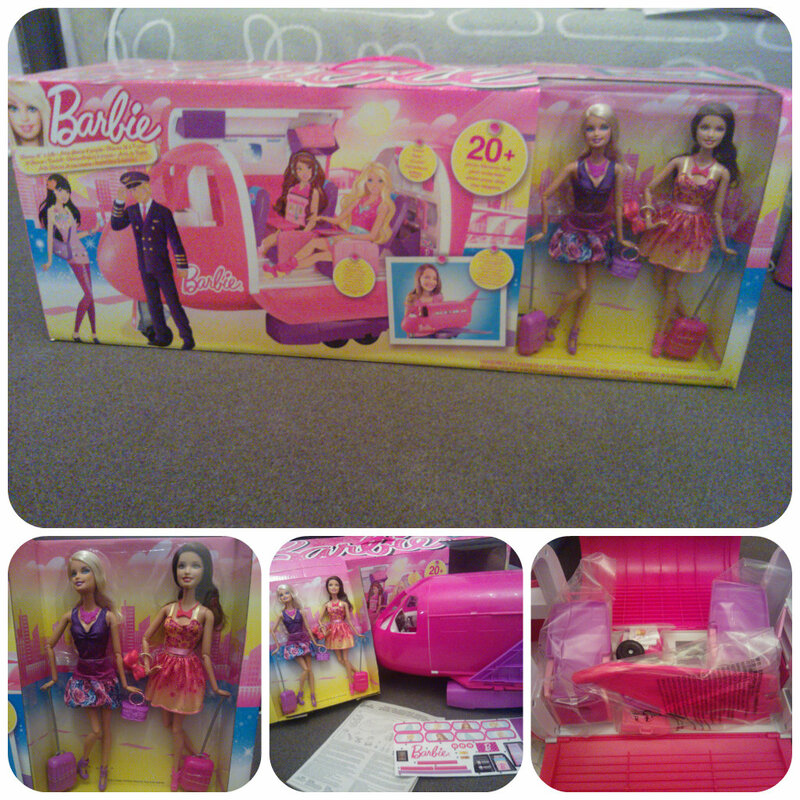 The Barbie Jet playset comes in a huge box and Miss M thought Christmas had come early when she saw it. The box contains the jet and 2 Barbie figures, each in a pretty dress, necklace, shoes and carrying a handbag and suitcase each. The Barbie Jet requires a small amount of assembly from the box but this is simple to do and can be completed within 10-15 minutes. The front wheel needs attaching and the tail end of the plane requires piecing together. The side wings simply fold up vertically against the side of the plane when not in use to save space. The chairs need to be attached to the base of the plane and a sheet of stickers need to be applied in the correct places. I found the stickers simple to attach and they appear to be hard wearing and not likely to come off. 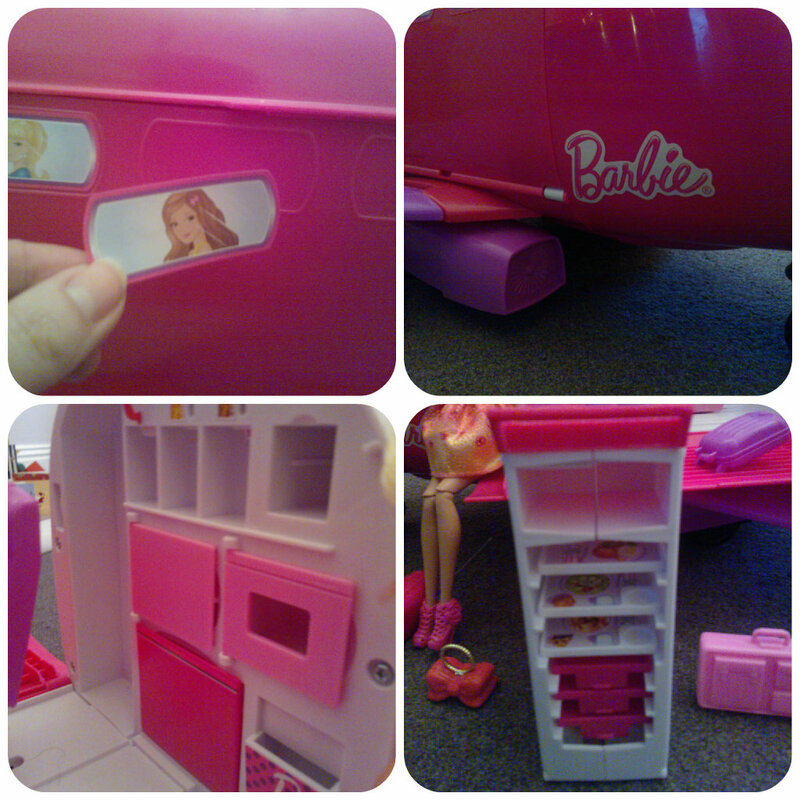 The main body of the Barbie jet folds open creating a playset. Inside the jet are three chairs, all with seatbelts and fully reclining backs. You can slide back the windows to reveal night images and there is overhead luggage storage. At the back of the plane is an air hostess area containing a pull out trolley with three trays and rectangular meal plates that sit on the trays. The trays fit over the chairs and clip in each side. There is also a fridge, microwave, storage area and drinks machines. Also included are three glasses and three sets of cutlery. 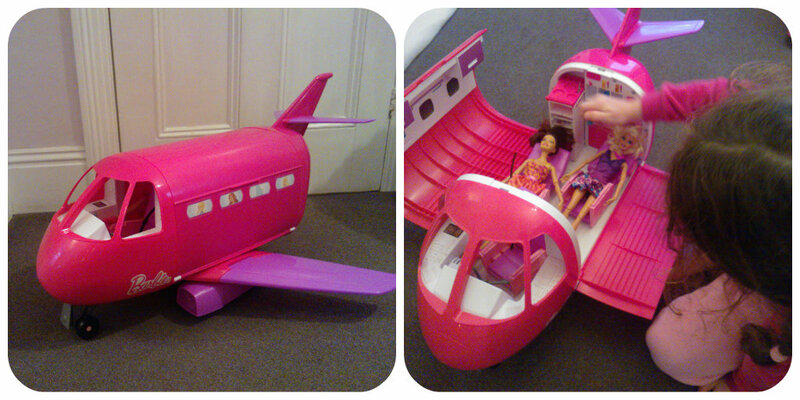 There is plenty of scope for imaginative play with the Barbie Jet playset. Miss M was keen to get the Barbies packed up and fly them across the front room to their holiday destination. Her younger brother Mister B was keen to join in making plane sounds and loved pushing the jet across the floor. 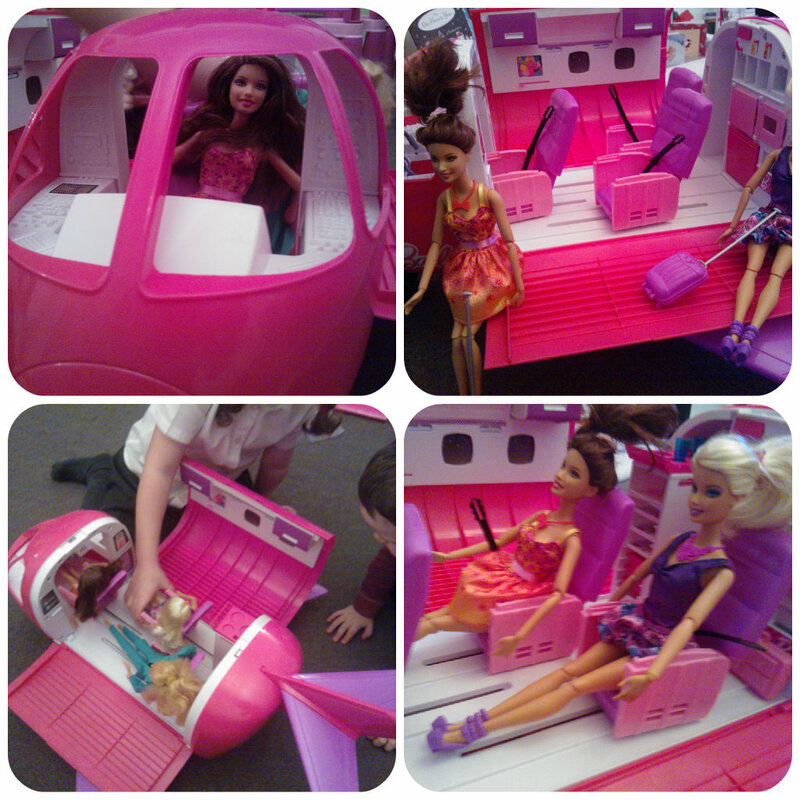 Miss M loves acting out the flight journey with the Barbies, packing the plane, serving them food before letting them recline their chairs and sleep before arriving at their destination. The Barbie jet really does provide lots of entertainment value and adds a further dimension to playing with dolls rather than just dressing them up etc. The Barbie Jet is larger than we first thought it would be, making it a prominent toy and one that has grabbed the attention of Miss M’s friends when they have visited. The jet has a height of 32.5cm, length 84.5cm and width of 28cm (with wings folded up). It is a great play piece that can either be played as a stand alone toy or easily fits in with other toys you may already have. The adventures with Barbie are endless, I see this as a toy that will get plenty of play value and be used in many different scenarios. 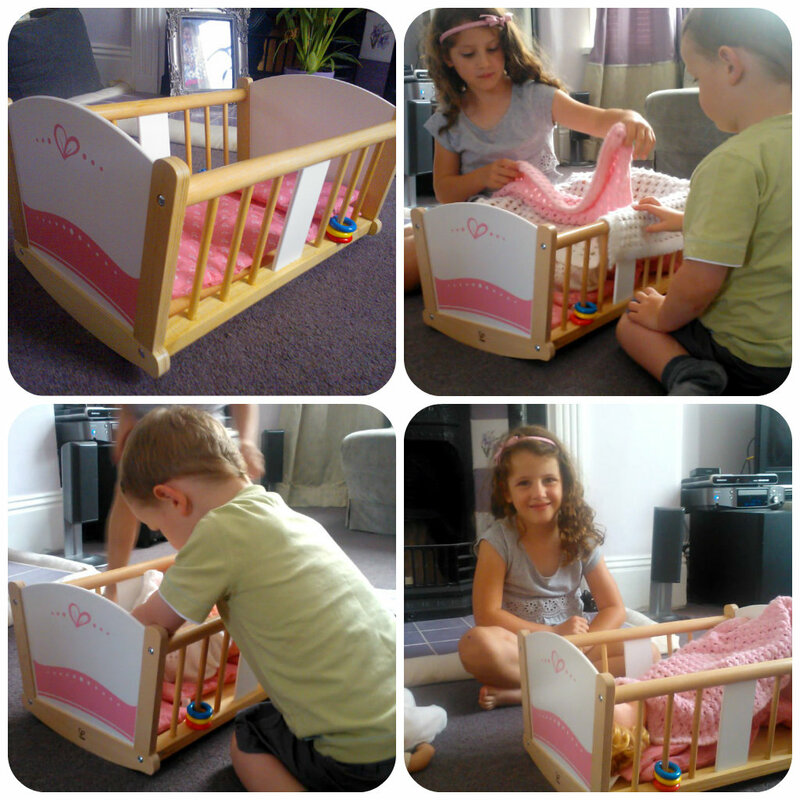 Miss M loves setting things up carefully inside ready for a day of play. She loves the jet and can’t wait to show her friends – being the size it is makes it ideal for a couple of children to play with it at the same time as they can easily reach inside and have a Barbie each to take on the flight. This is a dream toy for Miss M to own to play with her Barbie dolls and I think any other young girl who loves her dolls would feel the same. I think the Barbie Jet will be a much loved toy over the next few years. This post in written in association with Argos. All reviews are my own and my family’s opinions and we received the product in order to write the review.